As fondue restaurants spring up across the nation, the fun of dipping tasty morsels of food into a communal pot of cheese or chocolate takes on a completely new flair. Expanding upon a 1970’s favorite, the new fondue craze caters to high-end diners with discriminating palates. With a little creativity, you can create your own four-course fondue extravaganza. Create a festive atmosphere for your four-course meal: cover the table with a cloth; serve the drinks in long-stemmed glassware and find a central location for your fondue pot. (Make sure the pot is accessible to all your guests.) 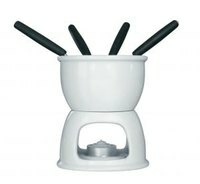 If you plan to serve more than four guests, consider using two fondue pots. Start the meal off with an appetizer cheese fondue, created by pouring a little wine in the fondue pot and adding shredded cheeses, minced garlic and diced peppers. Add your choice of seasonings, and stir until creamy. Dip cubes of bread, fresh vegetables or slices of green apples for a delicious first course. Follow the appetizer with a green salad, prepared with your choice of vegetables and dressings. This gives you time to wash the fondue pot in preperation for your entrée. Add some flair to your salad with toasted nuts and aged grated cheese. Dip the meat into the boiling broth. The broth must be simmering to cook the meat sufficiently. 1-inch chicken chunks take approximately 3 minutes to cook and the other meats take between 3 and 5 minutes. Combine melted white chocolate with your choice of caramel, marshmallow crème, peanut butter or a desert liquor. Amaretto and rum are excellent choices. Provide a platter with chunks of fresh strawberries, bananas, pound cake and brownies for a creamy delicious end to a spectacular four-course fondue meal. Use your imagination when compiling sauces for dipping. Substitute lager beer for wine, dark chocolate for white chocolate, and add as many spices as desired. Make sure your guests cook all meat thoroughly and follow sound food safety practices.